PARIS – I seem to be on a roll of attending and writing about open mics in Paris that are off the beaten path of the Latin Quarter. Last night for the first time in at least a year, I attended the open mic of the Chansonniers, which takes place just once per month, on the third Wednesday of the month. And I am so happy I did so…. 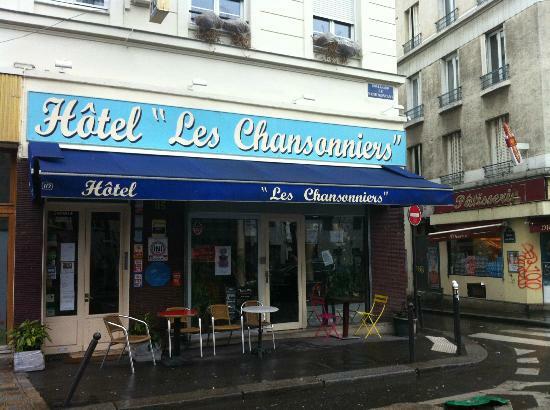 The Chansonniers open mic is quite original, as it takes place in the nice, cozy, warm lobby of a small hotel, which I would not classify as seedy, since it does have this nice lobby, and this superb open mic. On the other hand, I don’t know what lies behind the lobby door… maybe I should find out…. Having said that, I first attended this open mic five years ago – already!!!!! – and made some of my first steps into the French open mic world there, and have some very warm recollections. But for various reasons, I have not been going in recent years. Part of the problem is its “once per month” angle. You tend to forget when you hit the third Wednesday…. Menilmontant is a very cool quarter of Paris in the 20th Arrondissement that has a real workers’, bona fide “lived in” neighborhood feel too it, but that is growing into an artistic center of the city. I love the area. So why am I not going back more often? The open mic is now hosted by Franck, whose stage name is She/Me, and it seems to me that this is probably the open mic in Paris that takes the title of being the most French of the open mics. I think the only acts that sang in English last night were my own, and the couple of songs that Raphaëlle did – both of which were recent ones for which I wrote the lyrics (so that makes my English omnipresent there last night) – excepting her fabulous Spanish song. I managed to get a good video of her Spanish song, and she got a video of my Borderline. So those are both going up here. There were many more worthy acts last night, but I again have had a very slow internet connection today, so I will be unable to put up a full selection. Oh dear, I almost forgot! There was indeed the interpretation – quite different – of Moriarity’s “Jimmy,” with Franck on guitar, and a friend of his doing the vocals. I got that up…. It’s three songs per performer at the Chansonniers, and it starts early, so if you do want to play, get there early. The sound system is not bad, but the guitar amp is behind your feet and the vocals come out of speakers in the back of the lobby – I’d have got some better vocal recordings otherwise….